How to import bulk data from excel sheet to SQL Server? 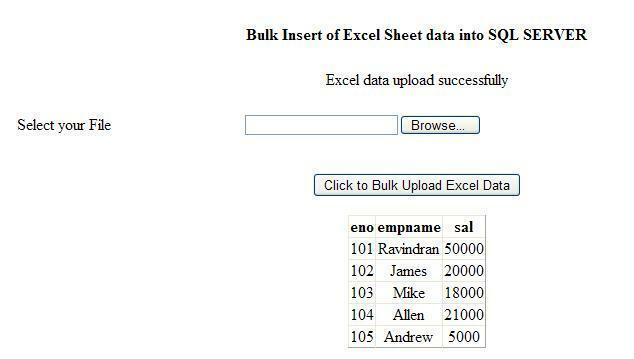 In this article I am going to explain about how to insert bulk data from excel in to SQL server table. This code snippet is may be help you in future to import data from excel. I have import data from excel to sql server using SqlBulkCopy class Instead of writing loop to retrieve and insert this one is quickly insert into sql server table. In the client side I collect excel sheet from user using file upload control and I have designed client side like below. I hope this code snippet is helping you to know about import bulk data from excel sheet into sql server.